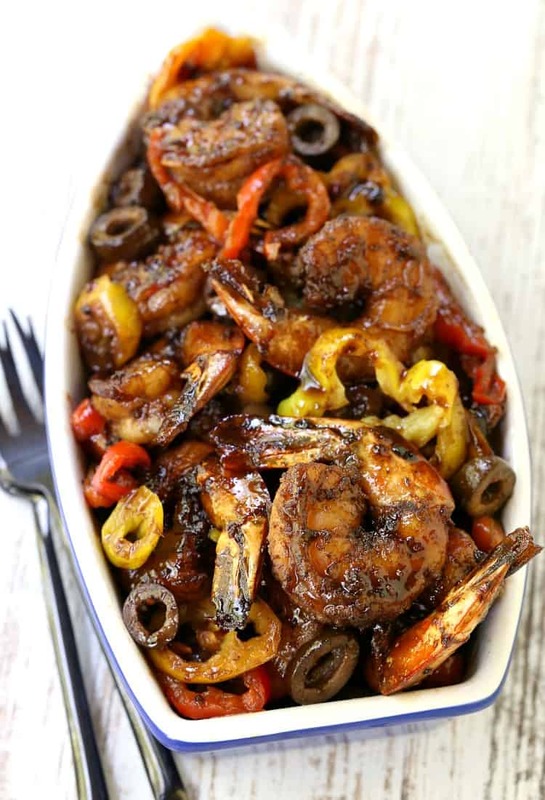 Sweet and Spicy Balsamic Glazed Shrimp is perfect for appetizers or dinner! 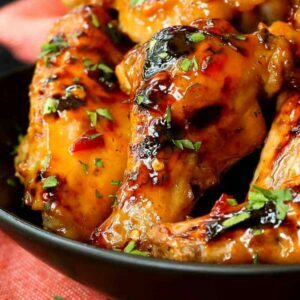 The sweet and spicy flavors in this dish are perfect together! There’s nothing more I love than having appetizers for dinner. Although I do love a good hearty dinner every now and then like this Sausage Stuffed Chicken Rollatini, but sometimes a few drinks and a light bite of food is all you need. Especially in the warmer months when you don’t want a giant meal. 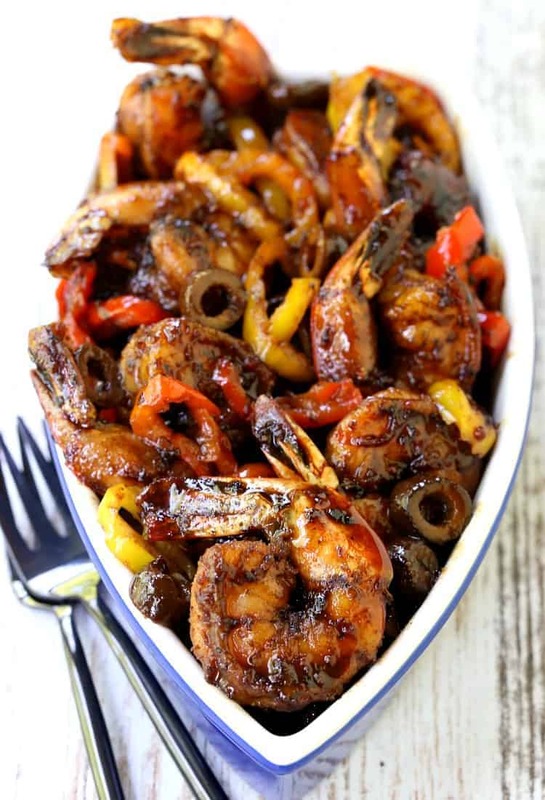 This Sweet and Spicy Balsamic Glazed Shrimp is totally perfect for nights that you just want a light meal, or need a light appetizer for a party. We seasoned this shrimp up with Trader Joe’s 21 Seasoning Salute, it’s such a great spice blend we’ve been putting it on everything. I feel like a walking Trader Joe’s ad all the time, I’m not – no ads for TJ’s here – just love the stuff there. If you can’t get it you can use your favorite seasoning blend or just good old salt and pepper. 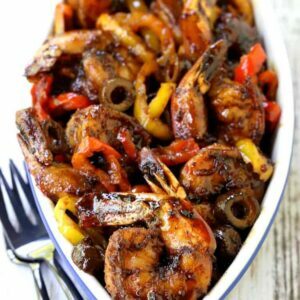 This Sweet and Spicy Balsamic Glazed Shrimp is not something you want to make ahead of time though, the shrimp will get overcooked and tough when you reheat it. But since it really fast to make that’s not going to be a problem. All you need to do is get the shrimp seasoned up and seared in a pan. Then remove them to make the glaze…this Sweet and Spicy Balsamic Glazed Shrimp is our take on an appetizer we get at one of our local pizza places. Fried calamari with a balsamic glaze, peppers and olives. It’s so good, we get it almost every time we go there. Instead of doing fried calamari we chose these jumbo shrimp, easier than frying calamari and also keeping it a lighter meal, and lower carb than having all the breading if you’re following a low carb plan. 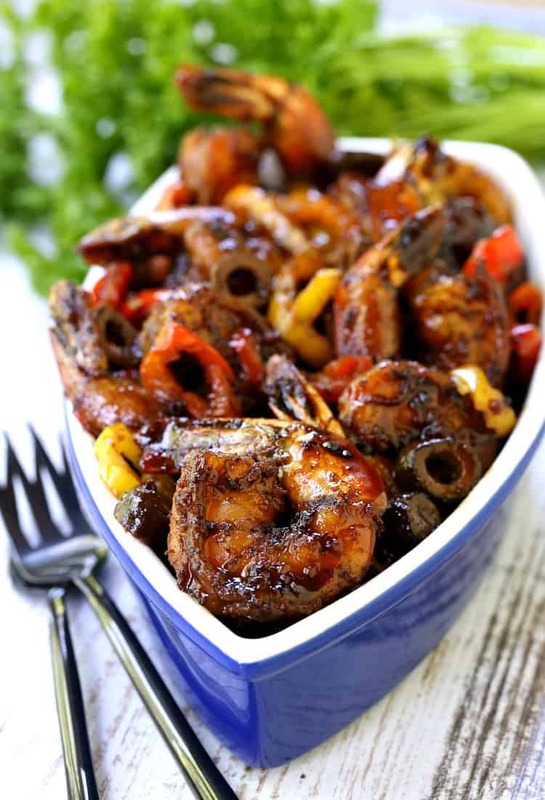 Now toss the shrimp together with the peppers, olives and glaze and serve. Lots of bread if you’re a carb lover or just like it is if you aren’t. You can get this shrimp on the table in about 15 minutes, so don’t worry about doing it last minute, it’s going to be done before you know it! Season the shrimp with the 21 Seasoning Salute on both sides, then with salt and pepper to taste. Melt the butter and oil in a large skillet over medium heat. Add the shrimp in a single layer and cook for 2-3 minutes on each side. 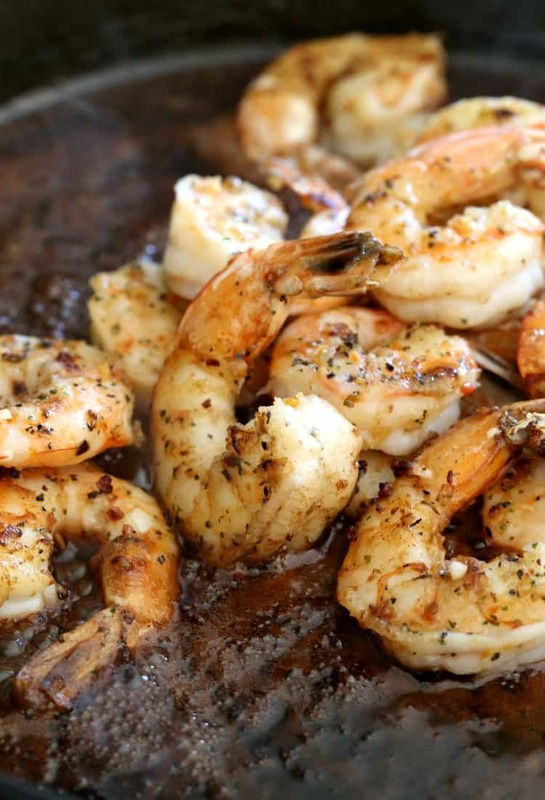 remove the shrimp from the pan to a plate to keep warm. 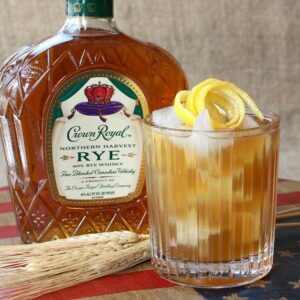 Pour the wine into the skillet to deglaze, scraping up the bottom of the pan as you whisk. 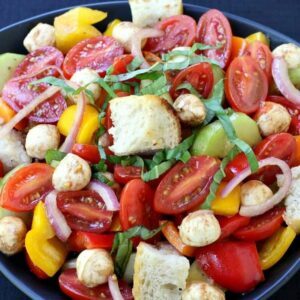 Let the wine reduce for a minute, then add the balsamic vinegar, honey, dijon and pepper juice. Stir to combine and simmer for 5 minutes. Add the shrimp back to the skillet along with any juices from the plate. 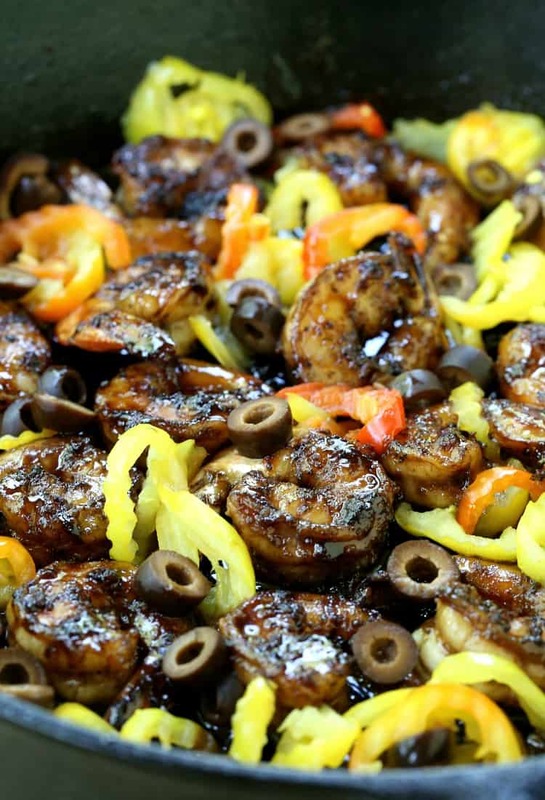 Stir in the banana peppers and olives and cook for another minute or two just to warm the shrimp up.